24hrTradingPins - RUSH Trading Pins! Need Trading Pins Fast? Other Pin Companies can’t meet your deadline? Stressed out? We can help! Welcome to 24HourTradingPins.com. We are considered the " Relief Pitcher" of trading pins, we get the job done. 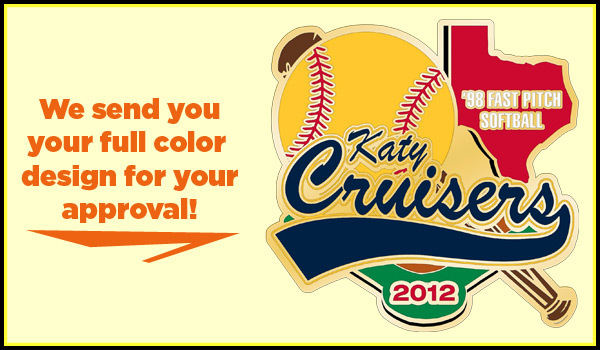 If you need trading pins tomorrow, we got you covered with our selection of in stock Baseball pins and Softball pins. 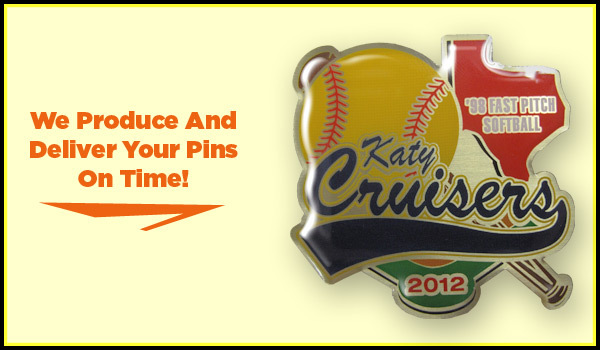 Need custom designed pins exclusive to your team? We can handle that too with our 5 day, 7 day and 10 day rush pins based upon your design criteria. All of our pins are manufactured from Metal (no cheap plastic pins here) and will have the highest degree of “Trading Power” to ensure that your teams' pins are as competitive as the team players themselves! Our 24 Hour Stock Rush Pins are available in 2 different sizes and are manufactured as Soft Enamel, Die Struck pins for the highest quality trading pins in the industry. We keep these in stock and ready to ship. Order by noon EST (Monday-Thursday), and your Pins deliver the next day. Our 3/5 Day RUSH Pins can have any design you desire digitally printed onto one of our 6 most popular shapes. 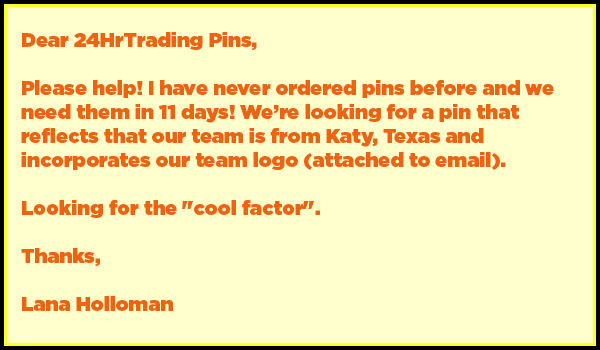 Our 7 Day RUSH Pins and 10 Day RUSH Pins will be made Custom, based totally upon your requested design. They can have any shape and any size. We also offer trading pin bags in two different shapes, the standard 450 pin rectangular shaped pin cases in 4 different colors, and our NEW Baseball Shaped Pin Collector Bags. We keep these in stock for immediate shipping. If you already have a design or need to order our 24 Hour pins and Pin Collector Bags, you can do that via our secure Online Order Page simply by CLICKING HERE! All of our trading pins include UPS or FedEx Next Day Air Shipping! So you can rest assured they will arrive by the fastest possible delivery method. Our design team is standing by and ready to produce a custom design for your team. Give us a call toll free 866-903-4876 without delay. We can deliver your pins on time! Ordering Is As Simple As 1, 2, 3!